Medical Acronyms, Eponyms and Abbreviations provides a comprenhensive listing of the most common acronyms, eponyms and abbreviations used in the medical profession, along with clear and concise definitions. This book is an invaluable tool for everyone involved in learning, reading, writing or interpreting medical terminology. The new 5th edition includes hundreds of new listings. From antibiotic-associated-colitis (AAC) to zoster immune plasma (ZIP), this handy pocket guide helps you translate those tricky acronyms and abbreviations. 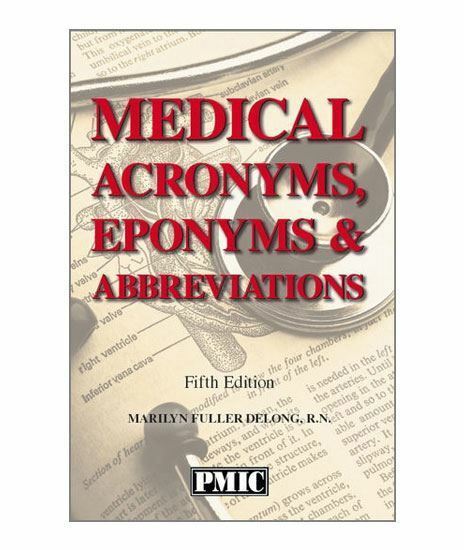 Hundreds of new medical acronyms, abbreviations and eponyms with the complete terms that they represent have been added to the completely revised fourth edition. The book covers all medical specialties plus the areas of nursing, administration, quality assurance, diatetics, pharmacy and lab.